Australia’s nuclear safety agency has ordered a review of Sydney’s Lucas Heights nuclear medicine facility after two radiation spills, and a separate investigation is under way into a mechanical failure that has caused delays in diagnostic tests across the country. The Australian Nuclear Science and Technology Organisation has had four safety breaches in 10 months and in recent weeks has had to call on US……. Distribution of the replacement nuclear medicine supplies was also disrupted this month after airline delays from the US prevented the medicine reaching clinics and hospitals for some days………. The supply problems caused by the mechanical failure have come as a review was ordered by the independent regulator, the Australian Radiation Protection and Nuclear Safety Agency and its chief executive Carl-Magnus Larsson, who issued the organisation with a direction under the Aus­tralian Radiation Protection and Nuclear Safety Act. The agency said the independent review it had directed would focus on quality control of molybdenum-99 (Mo-99), the radio­active agent used in diagnostic imaging. After the first safety breach when a staff member’s hands were contaminated on August 22 last year, ARPANSA found ANSTO to be noncompliant with its licence conditions, according to a statement from the safety agency. An internal review is being conducted into the conveyor failure on June 22 while the separate independent safety review into the ageing ANSTO facility is ­undertaken. ANSTO will appoint an independent reviewer. “This appointment is the next step on a path of continuous improvement. “Using recommendations from the review, we’ll identify what more can be done to make that facility safer,” a spokesman for ANSTO said. …….The conveyor has been fixed but compliance checks and a thorough audit will keep the production of nuclear medicine at a standstill for some time. The IAEA and the Australian Radiation Protection and Nuclear Safety Agency (ARPANSA) have agreed on a cooperation agreement outlining plans for joint work to strengthen radiation protection of workers in the uranium mining and processing industries. This cooperation will address potential harm that could be caused by the higher concentrations of naturally occurring radioactive material (NORM) that can be the result of the processing and handling of raw materials. The Practical Arrangements, signed on 24 May in Melbourne, Australia, builds on an earlier agreement under which work was conducted to create a publication on occupational radiation protection approaches in uranium mining and processing stages and techniques, as a part of the IAEA Safety Report Series. The report was developed during meetings in Australia, Canada and South Africa involving regulatory body and industry representatives. The cooperation under the new three-year agreement is expected to provide practical tools for regulators, mine operators and workers through a training package that supports the use of the report’s recommendations. Also as part of the agreed cooperation, ARPANSA will help the IAEA strengthen its global survey on Information System on Occupational Radiation Protection in Uranium Mining (UMEX), which aims to improve protection and safety through sharing of good practices and other information. A staff member at the Australian Nuclear Science and Technology Organisation facility at Lucas Heights has been involved in a spill of radioactive material, the second such incident in 10 months. A quality control analyst working in medical production was involved in the spillage of about one millilitre of the radioactive isotope molybdenum-99 early on Thursday morning, an ANSTO spokesman said. “The staff member was wearing full protective clothing. An occupational health physicist checked the analyst and confirmed no skin contamination,” the spokesman said. The employee was then cleared to go home and returned to work on Friday. A source told Fairfax Media, however, that employees at the site “are concerned with the most recent number of safety breaches and lack of management support”. ANSTO was keen to stress that Thursday’s incident was “very different” from one last August, when a staffer reportedly spilled a quantity of the MO-99 isotope, causing a “significant radiation dose”. The site has had other radiation events, such as one reportedly involving four staff in 2012….https://www.smh.com. Guarded nuclear shipment to secretly depart Sydney SBS News, 1 June 18 Any day now a decade’s worth of heavily guarded nuclear cargo will be secretly transported through Sydney’s streets and sent to France for reprocessing. 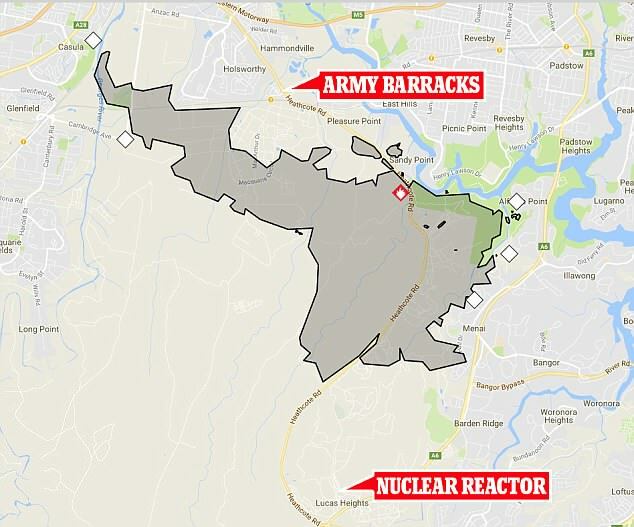 ….. Any day now a decade’s worth of spent nuclear fuel assemblies weighing 24 tonnes will be moved out of Sydney’s Lucas Heights facility in a highly sensitive transport mission months in the making. An ANSTO spokesman has assured the public of the operation’s safety, saying the radioactive materials will be enclosed in specially-designed transport casks reinforced with lead and made to withstand almost anything, including a jet fighter crash. “There is no credible chance of any accident or incident that could result in the cask being compromised,” an ANSTO spokesman said. It will be the 10th transport mission of spent nuclear fuel assemblies, with the last shipment sent to the United States in 2009. The spent fuel has come from Australia’s multi-purpose OPAL reactor…..The reprocessing project will cost $45 million, including the contract with France, equipment, staff and other costs. Once the uranium and plutonium are extracted, they will be recycled into overseas civil power and research programs, with the remaining materials vitrified into a safer form for waste storage and sent back to Australia….. The spent fuel assemblies, which would have been considered high-level waste, become transformed into an intermediate level waste, Hef Griffiths, ANSTO’s Chief Nuclear Officer told AAP. But the question of where it will be stored remains. The waste from this year’s transport mission will be returned from France in many years’ time and sent to the yet-to-be-built National Radioactive Waste Management Facility where it will be kept in storage for several decades. Firefighters Warn NSW Is “Not Out Of The Woods” On Third Day Of Bushfires, Pedestrian. 16 Apr 18 More than 250 firefighters continue to battle bushfires in NSW’s southwest, which has spread more than 2,400 hectares since Saturday afternoon. The blaze, which is believed to have originated in the vicinity of Casula, was fanned further by strong winds on Sunday. More than 500 firefighters from the Rural Fire Service, Fire & Rescue NSW and the Australian Defence Force attempted to contain the blaze over the weekend with help from volunteers and 11 water-bombing helicopters. 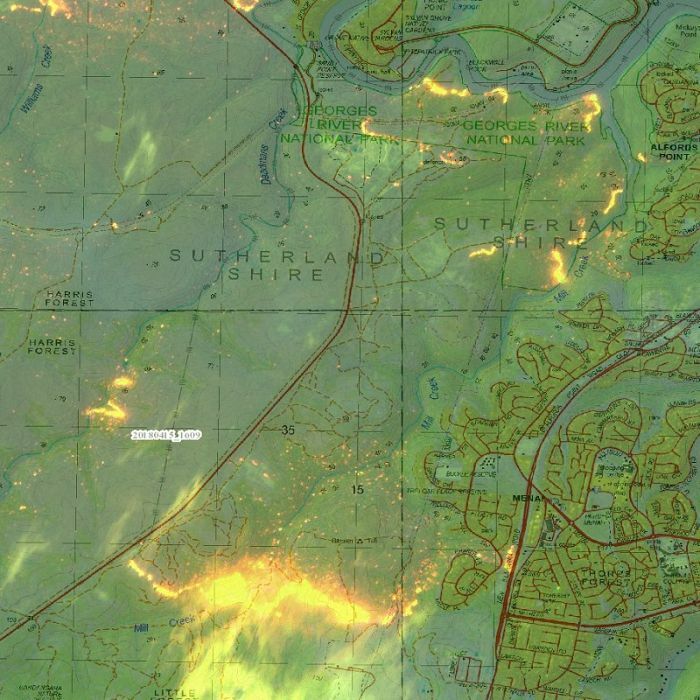 The fire tore trough Holsworthy military range, and while approaching suburban areas, has been staved off. Several residents report fighting off embers with hoses and water buckets. The fire was downgraded from “emergency level” to “watch and act” on 5.30pm Sunday, then again downgraded to “advice” around 2am Monday. While lower wind conditions are expected to help with containing the fire, RFS Deputy Commissioner Rob Rogers warned that the high temperatures remain an issue. There’s also a risk that winds could also pick up to 35km/h later today. Ten years worth of nuclear waste from Australia’s only reactor will be exported for reprocessing in a secretive high-security operation later this year. Spent nuclear fuel waste from the Open-Pool Australian Lightwater (OPAL) reactor will be taken to a French facility, then return Down Under for storage. The OPAL reactor — located at Lucas Heights in Sydney’s south — has a radioactive “core” about the size of a bar fridge and produces radioisotopes for industrial and medical use, including cancer treatment. It is operated by the Australian Nuclear Science and Technology Organisation (ANSTO). Over the past decade, spent fuel rods have filled up a storage pond that sits aside the reactor, which is the size of a small swimming pool. The rods are now due to be sent to France’s La Hague plant sometime in the middle of the year, but the date and route to the port remain confidential. The La Hague plant deals with almost half of the spent fuel reprocessing from the world’s light water reactors. It is the 10th time ANSTO will export nuclear waste and the first time for a decade. The other nine times involved waste from ANSTO’s older High-Flux Australian Reactor, which was decomissioned in 2007 after 50 years of service. There are approximately 100 nuclear waste storage sites around Australia. Several Sydney councils have banned the transport of radioactive material within their boundaries. The process has also been the subject of protest campaigns by organisations including Greenpeace and Friends of the Earth. ANSTO Chief Nuclear Officer Hef Griffiths said spent fuel has been transported for reprocessing since the 1970s. “In that time we estimate there’s been about 250,000 shipments like this worldwide,” he said. Mr Griffiths said the casks used to hold the spent fuel assemblies are “designed to withstand the impact of a fully laden F-16 fighter jet crashing into it without any release”. 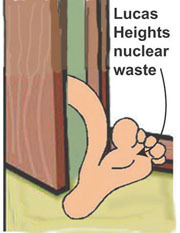 Jim Green, National Nuclear Campaigner for Friends of the Earth, said transporting spent nuclear fuel was not without incident. “There are numerous documented examples of problems transporting spent fuel,” he said. “In Germany and France in the 1990s there were serious contamination incidents which led German chancellor Angela Merkel to suspend the transport of nuclear fuel between the two countries. “It’s dishonest for ANSTO to be claiming there’ve been no incidents of any consequence involving spent fuel transport,” Mr Green said.